This is an updated version of my old “happiness & freedom” post because I found a great world map to put with the original chart and I have thought about it a little more. Plus. I imagine this is part two of “freedom of” (a post I wrote a very long time ago) if only because it follows up the burden of responsibility that comes along with having ‘freedom of’ by recognizing, that despite the burden of that responsibility, people who live in cultures with freedom tend to be happier people. I do follow this thought with some facts (some research) but let me suggest subjectively that the concept doesn’t surprise me. But, in general, people are happier if they feel like their voice matters (and being able to vocalize or have freedom of choice is one way of ‘mattering’). 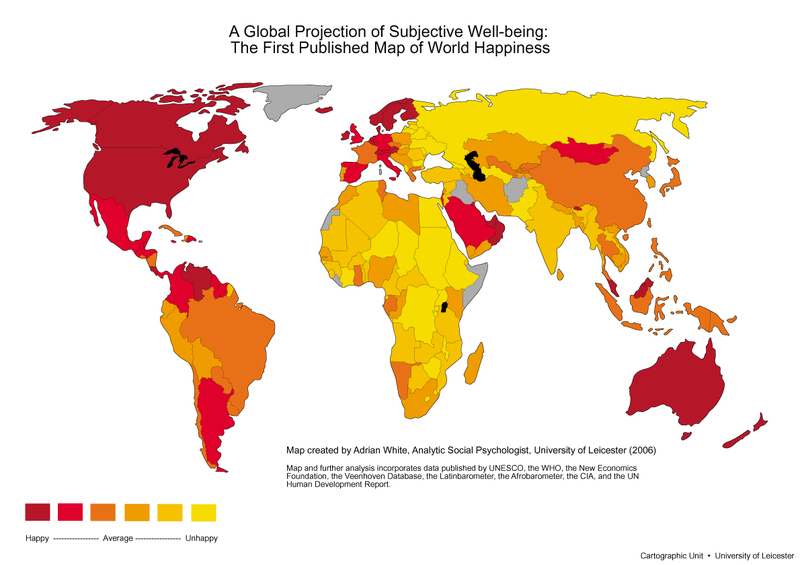 What I find most interesting in this map is the fact it looks like Mongolians are very happy. Go figure. While joking about Mongolia (being happy) I actually did type it to make another point about world happiness. Several studies have been done to analyze the relationship between country/world happiness and wealth (or GDP per person). So a country like Denmark comes out on top (and this isn’t surprising because they have a generous secular welfare state which uses the tax commons to ensure no one does without), and indeed 64% in one survey describe themselves as “very satisfied” compared to only 16% in France. Interestingly The U.S. (one of the wealthiest countries in the world), when measured on the GDP/person to happiness scale, is almost on a par with “middle income” nations such as the UK and Brazil. This suggests that while wealthier people declare higher satisfaction with their lives when you look at the country in aggregate, the richer country appears no more satisfied than middle income ones. This can mainly get explained by the fact the wealthiest 2% control some 65% of the wealth in a wealthy nation like the U.S. therefore the remaining 35% of income has to be split amongst the remaining 98% of the population (which decreases satisfaction when measured against wealth). And it is in middle income nations where the taxation is typically progressive and therefore provides the means to live in “quality” for the majority. In those cases people will not have extraordinary wealth but no one will live in poverty either. Anyway. I added this because I am writing a post here about happiness associated with some form of democracy (or freedom of thinking & choice) and I am willing to bet someone wanted to begin the “you are avoiding wealth as a factor of happiness” debate. It figures that I find a piece of research and an awesome graph (with lots of little data points) and I cannot remember who did the research (so I apologize to that person/team). By the way. I don’t want to suggest these findings refute past evidence that genetics (figured I should bring this up because I also addressed wealth) play an important role in subjective overall contentment/health (that has been proven before). However, the research analysis indicate genetic factors are only part of the story because happiness levels vary across different cultures. And since ‘cultures’ is simply a term for a “grouping/gathering of human beings” (and therefore human nature) this suggests that the pursuit of happiness is not completely futile. Genes may play a crucial role, but beliefs and values may be the engine that gets happiness going. The research findings also indicate that varying levels of well being are closely linked with a society’s political/government construct. In other words sharp declines in a society’s level of well-being can lead to the collapse of the social and political system and conversely high levels of well-being contribute to the survival and flourishing of the social and political system (it just so happens that democracies flourish more often than collapse). So. 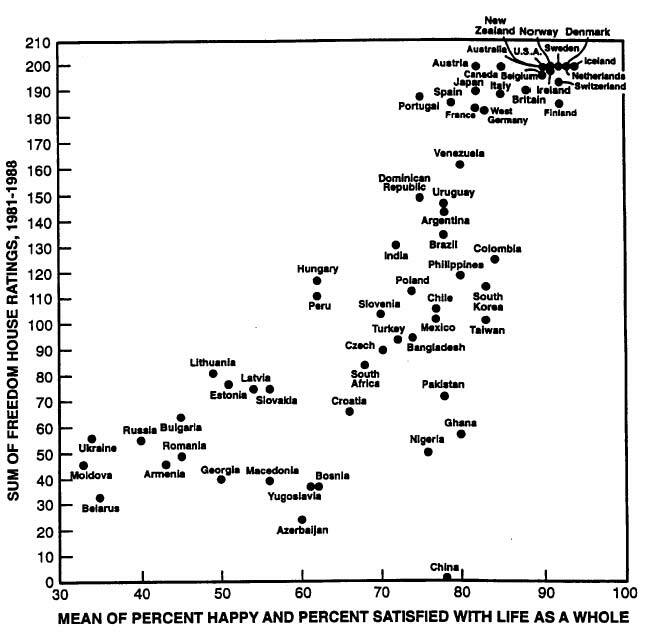 Through this research they have discovered (in their words … “we now know”) that a nation’s past government structure, economic development, and freedom are closely related to well being, and that freedom has the highest correlation with well being suggests that it is the strongest factor. And well being translates to happiness. Hey. This is kind of like if A plus B = C then … well … okay … whatever. Just another reason to support ‘freedom of’. Just in case you need to have it spelled out … being happy is better than being sad. If freedom contributes to happiness, well, you can’t beat that. *note: I am following this post up with one on what is happening in the Middle East and the fact that attaining a democratic structure doesn’t happen overnight (although we impatient Americans cannot believe it hasn’t happened yet).